In an interview conducted in 2003, ROAPE’s Leo Zeilig spoke to Nelson Chamisa. Chamisa was then the National Youth Chairperson of the Movement for Democratic Change (MDC) In the early 2000s, the MDC was a very different organization, founded by a mass movement, with a large working-class membership many in the Zimbabwe Congress of Trade Unions (ZCTU). For a time, the MDC seemed on the verge of toppling the ruling ZANU-PF, in elections and on the streets. Now leader of the MDC, Chamisa promises his supporters victory in the elections and resistance if he does not win. In 2003 he was a 25-year-old organizer of a mass party, who, in this interview, reflects on his own activism as a student militant, his hope for socialist change and life as a Member of Parliament. Leo: Can you tell me about yourself and the position that you hold in Zimbabwe? Nelson: Currently I hold quite a number of positions. Of course, the first one is I am a Member of Parliament for a constituency in Zimbabwe called Kwadzana and I am also the National Youth Chairperson in the MDC, ever since the inception of the party in 1999. I was elected in an inaugural congress in 2000 as the Youth Chairperson. I have been a student leader as Secretary General of the Zimbabwe National Students Union (ZINASU) from 1998-2000. I was also the Student Representative Council president for Harare polytechnic 1998-9 and also 1999-2000. I served two terms of office. I had to leave my position when the party was fully fledged. It was no longer possible for me to balance activities as a political activist and my activities as a student activist. Leo: Can you describe your background, so where you came from. Your family and how you came politically active? Nelson: I always been active as a young man, although starting at very low levels at school. In primary school I was active on those microcosmic issues about how you get ball-point pens distributed, how you improve your relationship with the teachers, preventing them from beating you and disciplining you and all those things. But I think that I started to be really active in a representative capacity at my secondary school which was in Masvingo province. For my A levels at Victoria High I was then active in the debating club on national issues. We actually managed to be political at that level, headmasters expect you to accept everything as gospel, but we became critical and we did not accept the patronizing attitudes that were typical in High School. I then went to polytechnic where I started my radical activism. This was in March 1998, when I got to the polytechnic, conditions there were quite appalling, and I found that students had no freedom to make their own decisions, to represent themselves and to articulate their own issues about academic freedom and the autonomy of tertiary education within the broad framework of governance. So, we said that should not be the case, and we sort of rekindled activism. I felt we needed to reinvigorate the student movement and we managed to do that. We then engaged in joint activities under the umbrella of ZINASU on anti-privatisation demonstration and anti-corruption demonstrations in 1998, which led to the closure of the polytechnic and the University of Zimbabwe (UZ). You have already touched on it, but can you talk about the motivation for those closures? Definitely there was a question of the payout and corruption in the corridors of government. But the most important historical event that motivated us to say, ‘It is possible for a student movement to make a difference in a country’ is what had happened in Jakarta in Indonesia [the Indonesian revolution in 1998 which eventually led to the resignation of President Suharto]. It played a very critical role – the Indonesian revolution, it was possible there it could also be in Harare. Most of the songs we were singing had do with Suharto being overthrown. Can you remember any of the songs? Of course, I can sing one of them. [He starts to sing] ‘Suharto aenda nengoro yemoto, Kana uchienda kuenda tanga wadhingura Mugabe.’ Meaning to say that, Mugabe has been overthrown, it is possible to remove Mugabe. If you want us to progress let us remove Mugabe because if we remove Mugabe all our problems will be solved. So, the motivation was to say that as students we were becoming the vanguard of the struggle. You must know that students usually have this microcosmic approach to issues, they deal with campus issues, like payouts, questions of freedom in higher learning but on this one we were trying to nationalise the student agenda, to be of consequence to a broader body politics in the country. We managed to make an impact, literally business was bought to a standstill during all of these demos. The closure of these institutions played a pivotal role in ensuring that the agenda and message that students were communicating was received by everyone across the country and we were very happy. Of course, the closure of institutions showed us that there were problems of students linking and connecting to broader issues, it was also a process of students learning to play a national political role. Ideologically how did you describe yourself, define yourself at this time? We believed in socialism, big time. We were socialists. I think it would be unfair and a distortion of history for any activists to talk about student activism without mentioning socialism and International Socialist Organisation (ISO). I was a member of ISO and quite an active member. ISO is a very significant chapter in the history of student activism. Most of our comrade and most of those before us Tendai Biti – who is now an MP – as a student activist, Learnmore Jongwe, Sikhala, Brian Kagoro, Hopewell Gumbo, myself we were all very active in ISO and our politics was motivated by that kind of radicalism. Especially at the polytechnic, we even had a branch and it gave us the motivation and helped develop us politically – ‘this is how we should take our struggle forward.’ Those debates were very important for us, because they focused us on bread and butter issues and on questions of privatization and politics. It emanated from our understanding of education as a right from a socialist perspective. But my heart bleeds if you look at the situation now, those things have just died down, we need to rekindle that kind of spirit. Because it has molded some of us in the hope that it would change the whole of society. You came from a movement that had been anti-privatization, that was informed by the ideas of socialism – inspired by the lessons of Indonesia and revolution. The movement you wanted to create was equally radical and for the poor. Is that how you envisaged it? Once the MDC was formed on 11 September 1999, there was incredible support for the new party. In 2000 you had the referendum vote and then in June the election. It must have been an incredible period? We just felt that finally people were beginning to understand. In fact, it was a rude awaking for Mugabe, we gave him a warning that he was finished. In June we got 57 seats, under conditions of violence and intimidation. I was now active full-time in politics [see Peter Alexander’s account of the historic 2000 elections]. Briefly can you tell me what were you saying to students at the time? Obviously, it was mobilization for payouts, but what about broader politics? By the late 1990s they knew that it was not possible for the movement to provide for them but that it required a broader transformation… we were fighting the struggle from very many angles, to go and get what we needed from the department of education and the government. So, we were fighting from within and from without. As a militant during this period, as the movement was rising constantly, the transition to democracy and to an MDC government, did you feel this was imminent, that it was going to happen within months? That was my feeling. Although it has been delayed, we feel that it is an inevitable end and we will have a government for the people that will look at the issues for the poor, and fight for them. Can you speak a little about the period of the formation of the MDC? At this time, you were trying to push radical politics and discussion in the new party? Look at those pictures [he points to the wall of his office, where there are photos]. That was on the 11 September, that one, when the party was formed. Yes, when we were forming the party, we did it as Marxists. Those were some of the demonstrations that we were on [he points to more photos]. This was during the campaign [another photograph on his desk]. I was elected unanimously, even in my absence I was not there. Because of my history as a student activist, people knew me. But surprisingly there was serious resistance from the leadership of the party who I think were being influenced by certain neo-liberal sectors in the country, to say these people are too radical, they are too young. But the very reason for forming the party was to create space for young people. The argument against you standing was that you were a loose cannon, with this radical background. You described yourself as believing in socialism, yet you found yourself in a party that was rapidly advocating the policies of economic adjustment and austerity that you had rejected in the 1990s and that the MDC had been established to fight against. How did this play out? We had a bourgeoisie element who came into the party to try to hijack the process and they succeeded for a period – in 2001 – in terms of writing polices that deviated from our original plans. So, they were altering some of the policies for their own neo-liberal ends, but we have been fighting in the party to refocus. The economic documents that they produced were a kind of bourgeois celebration. I think we have been trying to work on that, we are almost like a salad bowl – all these pieces coming in – but those capitalist elements were becoming dominant. Naturally when you have a rising movement and party, you tend to see people from the middle class come in with their very fancy ideas, who can defend their ideas in boardrooms and on the internet. Really poor people don’t have access to internet, don’t have access to debates at the level of the boardroom. So, the hijacking I am talking about saw the manipulation of what the party stands for in the outside world. It is part of the serious flaws of the movement. For a time, you were influenced by the socialist lawyer and activist Munyaradzi Gwisai [Gwisai was a leading socialist in the MDC and MP for Highfield, a working-class constituency in Harare, he was expelled by the party in 2002 and stood in Highfield as an independent socialist later that year]. Can you tell me something about this? It was very sad Gwisai was expelled from the party, it was a victory for the neo-liberal forces within the MDC, some of us who feel that Gwisai was correct, in fact I agree with comrade Gwisai in every aspect. In terms of the party what he would say in the party I would support him thoroughly. I did not support the decision of the executive to expel him, the revolution is beginning to devour its own children, especially the shinning stars of the struggle. Those who were the vanguards of the struggle. It is really sad. I hope that Gwisai will find a way back into the movement and I think this is the contradiction within the struggle. I found it difficult to campaign for our candidates in Highfield against Gwisai. I feel that Munyaradzi had deserved to win. I would have celebrated more if he had won. That is all I can say. It was unfortunate development. It is sad to be part of an executive which makes such a capitalist decision. Can you reflect on your political journey and your motivations as an activist and now MP? We formed this party to realise certain objectives, and those objectives have not been realised. It might not be the MDC which is ultimately going to fulfill these hopes, but we have started from somewhere, and the germ that we have started will ultimately be completed by some of us. This is what has been our thrust and this is what will continue to be our thrust. It was not started as a sectional project, rather a project for the poor and the poor should be finally rewarded in the project that they started. Not giving back to the bourgeoisie, not rewarding the fat-bellied politicians who hijack the cause of the downtrodden of our society. This is our project. 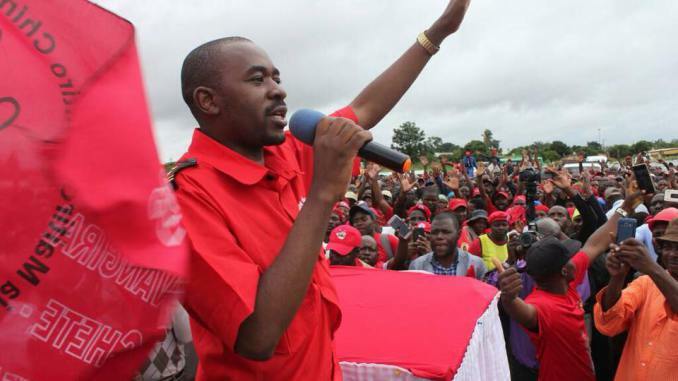 Nelson Chamisa is currently the MDC Alliance President and member of the House of Assembly for Kuwadzana, Harare. So what do you make of the endorsement of Chamisa by Mugabe and Chamisas public acknowledgement that he is in partnership with Mugabe? Timely interview Leo. My off-the-cuff comments below were posted I think on FB but it reminded me that there are still some issues that haven’t been resolved. So many of our Zimbabwean colleagues had to keep a low profile for all these years but there’s nothing like historical memory and here is the problem. Is it best to leave the present just to get on with it? Or, is it self-indulgent to try to set the record straight. On another matter, does anyone who reads this have any information about the murder of Father Francis/Mambo Press? He had dairies, entrusted to the amazing nuns at Bondolfi, but is there anyone left who knows what happened? 1980! Mugabe elected with Jan & LC there are UN Observers. I was in Masvingo/Bondolfi with the nuns, LC was North of Harare. Then we all met up in Masvingo where the night before, the evil Selous Scouts tried to break the doors down after they torched Mambo Press and murdered Father Francis. The Jesuits were fabulous, the nuns almost had a convert! See ROAPE 1981 for details which didn’t include meeting Sally Mugabe and Grace Machel in Mugabe’s kitchen. We were getting all the crevettes ready – ones that the Machels brought from Mozambique! And Sally was a Ghanian – I knew her formidable sisters in Accra.